My OUTLANDER Purgatory: A Whole House of Outlander! IT HAS FINALLY HAPPENED! My hub is reading Outlander!! And LOVING it. 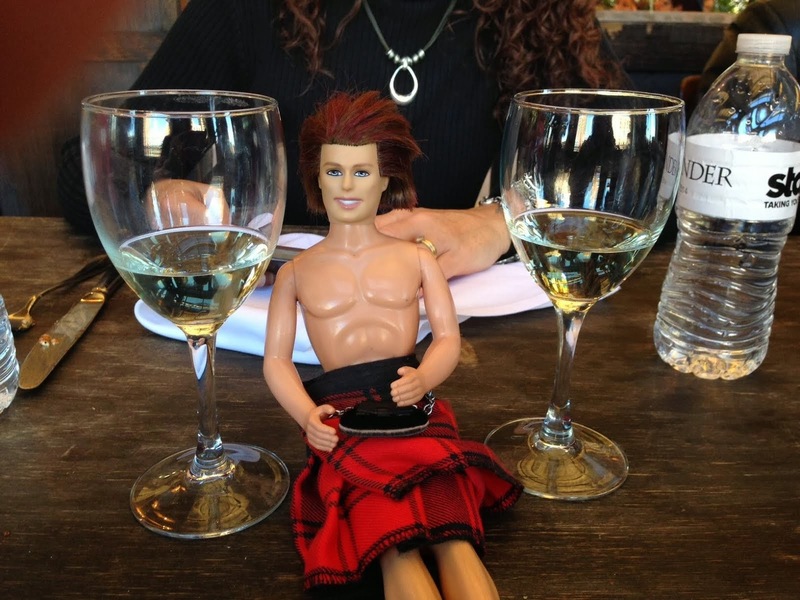 He tried last year and stopped after one too many mentions of James Alexander Malcolm Mackenzie Fraser's hot bod. But all these months of watching me chat on Mondays and listening to me wax on about Scotland's history (while HE'S of Scottish descent) has proved too much for him. He canna have an Irish/Italian wifey knowing more about his heritage than HE does. And let's face it, most of everything I know about Scotland, I've learned from Diana Gabaldon. And so it begins. Tom is at Castle Leoch and Claire is about to start helping Colum out by treating the sick. And get THIS - I just heard him outside explaining the story to my 9 year old daughter. You know, the pesky one who shows up in our videos from time to time, giving Tracey and me rabbit ears? Yeah - that one. Never has she asked her crazy-assed MOTHER about the story - oh no. Just my own beloved Scotsman. I love it! You should HEAR him out there telling her all about the standing stones and Claire's time travel. I wish I had this on video!!! Stay tuned, lads and lassies. This...is getting good. That is awesome!!! I would maybe if I'm lucky get DH to listen to audiobooks but he would never actually read the books. So jealous!!! I love this story!! I told my husband that he HAS to read it before our little weekend at the Fergus Highland Games. I gave my daughter a copy of her own. She just rolled her eyes. Sigh. Even if Jamie played in the Master's tournament or for the NFL my husband wouldn't read Outlander. Where did I go wrong? That is so awesome!!! My hubs keeps telling me "it's just a book you know!" ... He just doesn't understand. My husband read the 1st three books years ago, just so I could have somebody to talk to about them. In return, I had to promise to reenact some of the scenes. LOL. My husband read the first chapter and stopped. That darn first chapter...! Maybe some virtual peer-pressure will do the trick. Happy Reading, MOP Hubby! Julia - I would say it's a mix of a) I got him a Kindle for his birthday and b) we watch a lot of Monarch of the Glen...and I know the meaning behind all of the jokes (especially from Hector and Kilwillie) and he's the Scottish bloodline in the family! His grandfather was raised in Paisley and *I'm* the one who knows all about Culloden...Cumberland...Bannockburn...cairns...lairds..."the big house"...etc etc etc. And I'm always talking about the battles and the Revolutionary War and I think he finally got to the point where he realizes that things go much further and deeper than just "Jamie's bod". Carol - hopefully by the time he gets to the Wentworth stuff, he will be so involved in the story that he won't be able to stop reading. :) I don't think I can talk my husband into watching Monarch with me. However, we do watch True Blood, Vampire Diaries and Being Human (U.S. version) together - I've already watched all 3 seasons of the BBC Being Human - he has promised to watch those too because I keep telling him the BBC one is WAY better. Fantastic, and the fact that he loves it, even better. Still no luck here, not remotely interested even though he sees me reading and listening to it all the time. As a slight change of subject here for a few minutes, have you seen/heard about the winner of "Britains's got talent"? A Scot called Jai McDowall, he's a singer and he's fab. Already on Youtube but I couldn't get a link to work!! Great story! Ironically it was my husband who first told me about the books when he saw something in the New York Times Sunday book review years ago - he knew I had a strong interest in The Battle of Colloden. I don't know if I WANT him to read the books! Hahahah. They're MINE!!! But he has shown no interest in any case. I do tell him stuff, though! Very cool. It would be interesting to get another man's opinion. I guess I don't understand the idea of stopping reading at any part of the story once your invested in it, even the Wentworth scenes. They are part of the story, just because they are hard to read about doesn't mean you should quit, IMO. Then again, I can't recall quitting reading any book once I started. Congrats! Fun huh? I just got my DH to start reading with me (listening to audio & reading along with Davina)Jamie just took punishment for Laoghaire. We can only read for an hour before he starts falling asleep LOL Hey at least he is giving it a go with me Aye! That's awesome Carol! My DH isn't a reader and the best I could do was get him to read the summary in the Outlandish Companion which was still a pretty decent chunk of pages and a great explanation but by far not the same thing!